A PROFESSIONAL career, which began in obscurity against Brighton & Hove Albion in September 1992 ended in glittering celebrity - and tears - at the Parc des Princes in Paris. 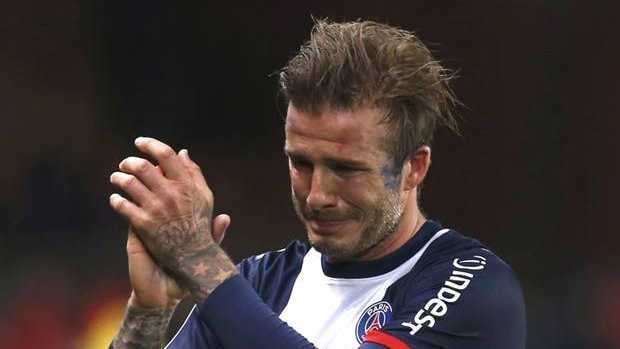 Tears streamed down David Beckham's cheeks for several minutes before he was substituted in the 78th minute after captaining the newly crowned French champions, Paris St-Germain, to a comfortable 3-1 victory over Brest, the bottom team in Ligue 1.Beckham, watched by a capacity 55,000 crowd including his wife, mother, children and former President Nicolas Sarkozy, had by far his best game since he signed for PSG in January. He played a part in the build-up to the first goal, scored by Zlatan Ibrahimovic, in the fifth minute. Then his free-kick from the left wing was scooped into the net by Blaise Matuide in the 31st minute - giving Beckham only his second assist for PSG. The whole Paris team surrounded and hugged the distraught Beckham before he left the pitch and ended his career at 10.35pm French time. To celebrate the club's first title in 19 years, most of the players in the Paris team had dyed their hair, or their bald pates, red, white and blue - the club colours. Beckham, sadly, did not. What a picture that would have been. It is not absolutely certain that this was Beckham's last match. Officially, he is available for PSG's last game of the season against Lorient in Brittany next weekend. Sources close to Beckham have, however, indicated that he does not expect to play next week. Leyton Orient (virtually the Leytonstone-born Beckham's home-town club) will be much relieved. They have been been besieged by callers who thought that Becks' last match was against L. Orient, not Lorient. Beckham leaves PSG with a French Ligue 1 winners' medal to add to his triumphs in the English, Spanish and US leagues (a record for an Englishman). It would be nice to able to say he turned around PSG's season and gave them their first title in 19 years. In truth, his impact has been minimal. His career stats with PSG before last night were: played 11, no goals, one assist, two yellow cards, one red. From the club's point of view, Beckham's stint with PSG was never about football; nor about selling souvenir shirts. It was about promoting the ambitions of PSG to be a giant in the world of football and their owners, the emirate of Qatar, to be a giant in the world of sport. What Beckham got out of it is not entirely clear. He was evidently determined to go out with a bang last night. He committed a foul after 45 seconds. He tried several long, raking passes - so many that the PSG manager, Carlo Ancelotti, warned him at one stage to keep things short and simple. At the toss of the coin before the kick-off, Beckham, wearing the orange captain's armband, grinned like a youngster playing his first match. TV microphones picked up the Brest captain asking Beckham, in excellent English: "What end do you want?" Beckham replied: "I don't care." The much-ballyhooed promise by Beckham to give his wages - estimated at about €200,000 (£170,000) a week - to a children's charity in Paris has still to be realised. The club have been besieged by requests but have still not announced which kids' charity, or charities, will get the money. Meanwhile Beckham's representatives have held talks with Major League Soccer over him purchasing a new club in the United States. The south-east is currently without an MLS team, and Miami has reportedly been considered as one of the possible locations by Beckham's advisers.